HomeResourcesAre Cover Letters Old School? If there’s something that needs to be explained—perhaps a gap in employment or why you’re pursuing a job that you’re underqualified for—they’ll often look to the cover letter for an explanation or additional information. Several confessed to only looking at the resume—and if interested enough in the candidate’s experience—will then read the cover letter. Not one of them told me they never read the cover letter. Not one. What’s the conclusion you can draw from my completely unscientific research? 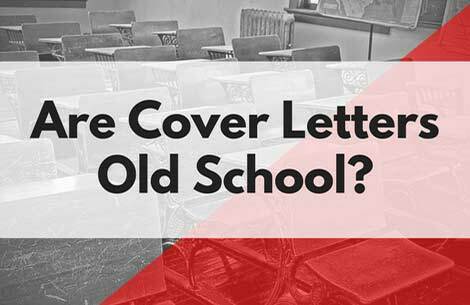 Cover letters aren’t old school. It’s how most people write them that’s old school. Here’s a few pointers for a better way to look at your cover letter. It’s a competitive advantage. They aren’t hiring someone to just join their super awesome company; they want someone who knows what THIS job is all about. 1. Think about a story or a project example from your past that the employer needs to know about. Not the “I-get-along-with-everyone” qualifications but the “This-project-relates-to-your-needs” example. A specific story. Example: You’re applying for a data coordinator position. You’ve been managing programs for the past few years (higher level of skill or experience than the data position) but part of what you do is manage large amounts of data to prepare federally mandated compliance reports. Because of some simple improvements you implemented—such as changing the reporting dates by a few weeks so the data was more complete and creating some basic dashboards for internal use—the process is more streamlined and accurate. This is your cover letter story. 2. Don’t start the letter telling the reader how you heard about their position (unless they’ve asked you to include this). Why? Every other letter will begin this way. Instead, acknowledge that while “Data Coordinator” isn’t your current job title, data is a huge part of your current role. Then describe how. If you’re following along at home—see #1 above. 4. Have a simple close. Sharing that you’ll follow up is corny. Or that you look forward to interviewing is presumptuous. Example: I look forward to learning more about the Data Coordinator role. There you have it. A distinctive cover letter that won’t sound like the other 199 they’ll be reading. Authentic, personable, and more casual than you might be used to. Experiment and see if it helps you stand out. I have a hunch it just might.